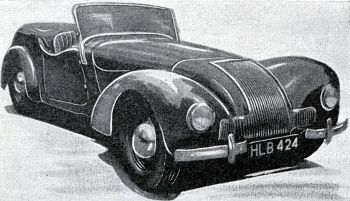 First sold in 1946 and resulting from Allard's pre-war trials cars. J1, is a short chassis competition car with cut away doors. Allard cars are powered by developed versions of the well-known 85 bhp, 3622cc Ford V8 Pilot engine. Mercury 140bhp 3917cc engine is optional. Top speed 85 to 100 mph depending on spec. Fairly crude chassis with split front axle ifs. and Ford transverse leaf sprung live back axle. Model L open four-seater have a wheelbase of 9 ft 4 in. Sydney Allard is a well-known participant in pre-war trials and speed events, using Ford-based Specials of his own design. 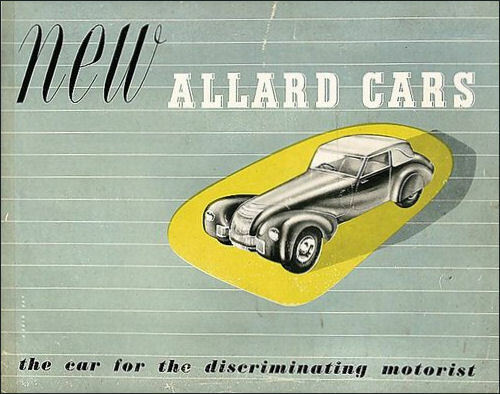 Quantity production of post-war Allard cars commenced in 1946. Powojenna produkcja Allarda wyróżnia się bogactwem oferty, w której znajdują się trzy odmiany nadwoziowe: dwumiejscowy K 1 , czteromiejscowy L i przypominający modele przedwojenne, wyczynowy J 1. Największy jest oczywiście L, z rozstawem osi 2974 mm, K 1 ma 2692 mm a J 1 skrócono do 2540mm.